Beautiful papaya botanical print. It is the work of Georg Dionys Ehret (1708-1770). The German artist was one of the most influential plant illustrators of the 18th century and considered one of the finest of all time. This lovely papaya drawing shows the caliber of his work. How lucky are we that a book first published in 1750 has been so well-preserved? 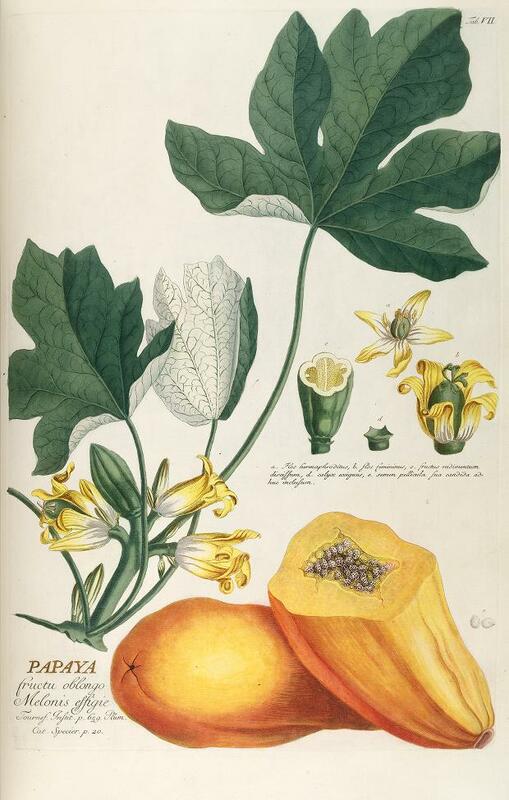 The print includes a pair of papaya, papaya flowers, leaves and drawings of how the fruit forms. Papaya fruit grows on large, tree-like pants with a single stem. Don’t the flowers remind you of plumeria? We already know that the papaya is yummy. But, did you know that the stem and bark is used to make rope or that the seeds are sometimes ground and used as a substitute for black pepper? Me neither. Now, we both do.